he secluded Long Beach in Barbados is the last beach on the south coast surfing circuit. This wide expanse of beach stretches for more than a mile and has a fairly sheltered and private setting. The water here is rough with medium waves and lots of undertow. It is also very windy making it ideal for kite Surfing and wind surfing. 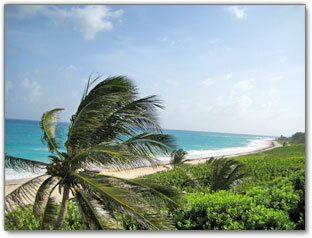 Long Beach is lined with coconut palm trees and is surrounded by a cliff of wild vegetation. This is a great find since it is seldom visited, either by locals or tourists. This beach boasts one of the most spectacular cliff-top ocean views on the island. This area was also once the home of the now demolished Long Beach Club. Because Long beach is so isolated, it is best suited for group outings and tends to attract kite surfers, weekend campers and group picnics. Long Beach can be found on the Atlantic Ocean side of the island, on the South Coast of Barbados in the parish of Christ Church. Send Long Beach Postcard to a friend!